72 • RV PRO • March 2019 rv-pro.com D E A L E R S Recession, in large part, to his decision not to acquire expen- sive inventory that he knew would sit stagnant on his lot. The one chance he took was retailing a Bigfoot motorhome with a $130,000 wholesale cost. "We had a guy come along and offer us $110,000," Sutton says. "This was the only unit we really had that was putting us in harm's way. We made payments on the difference, and we were glad to be free of that really expensive motorhome." From then on, Sutton kept a shrewd eye to his inventory, having success with Evergreen RV towables and coupling that with Airstream trailers. "A lot of Airstream dealers had gone out of business by that point," he says. "Airstream was our saving grace, and having units from both manufacturers really got us through those tough times." While the dealership found success retailing Airstreams, demand was often coming from customers outside the local market – and even out of state. That opened an opportunity for Sutton and his wife, Martha, to hand-deliver units to cus- tomers in California, Utah, Texas, Montana and even Florida. "Usually, with sales at our dealership, our employees handled walk-throughs with customers," says Sutton. "But, as we delivered Airstreams, Martha and I were performing them. 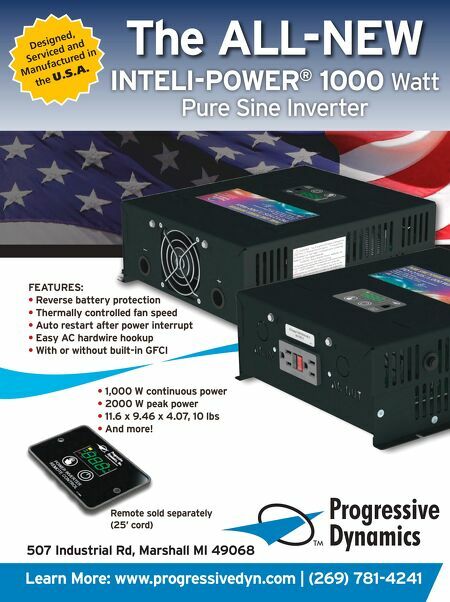 Through those experiences, we were taking feedback to our manufacturers." 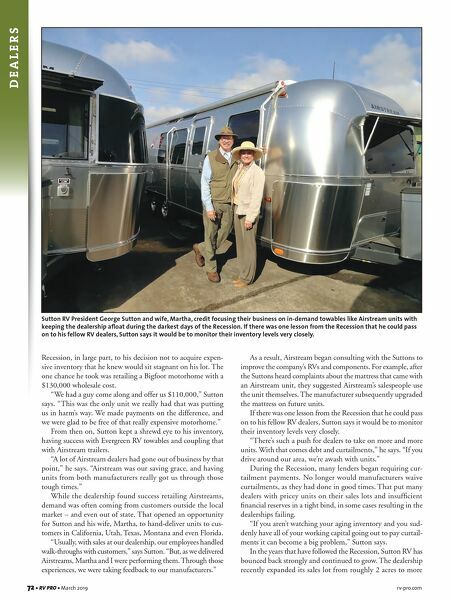 As a result, Airstream began consulting with the Suttons to improve the company's RVs and components. For example, after the Suttons heard complaints about the mattress that came with an Airstream unit, they suggested Airstream's salespeople use the unit themselves. The manufacturer subsequently upgraded the mattress on future units. If there was one lesson from the Recession that he could pass on to his fellow RV dealers, Sutton says it would be to monitor their inventory levels very closely. "There's such a push for dealers to take on more and more units. With that comes debt and curtailments," he says. "If you drive around our area, we're awash with units." During the Recession, many lenders began requiring cur- tailment payments. No longer would manufacturers waive curtailments, as they had done in good times. That put many dealers with pricey units on their sales lots and insufficient financial reserves in a tight bind, in some cases resulting in the dealerships failing. "If you aren't watching your aging inventory and you sud- denly have all of your working capital going out to pay curtail- ments it can become a big problem," Sutton says. In the years that have followed the Recession, Sutton RV has bounced back strongly and continued to grow. The dealership recently expanded its sales lot from roughly 2 acres to more Sutton RV President George Sutton and wife, Martha, credit focusing their business on in-demand towables like Airstream units with keeping the dealership afloat during the darkest days of the Recession. If there was one lesson from the Recession that he could pass on to his fellow RV dealers, Sutton says it would be to monitor their inventory levels very closely.